Need a delicious game day snack that won’t completely ruin your diet? 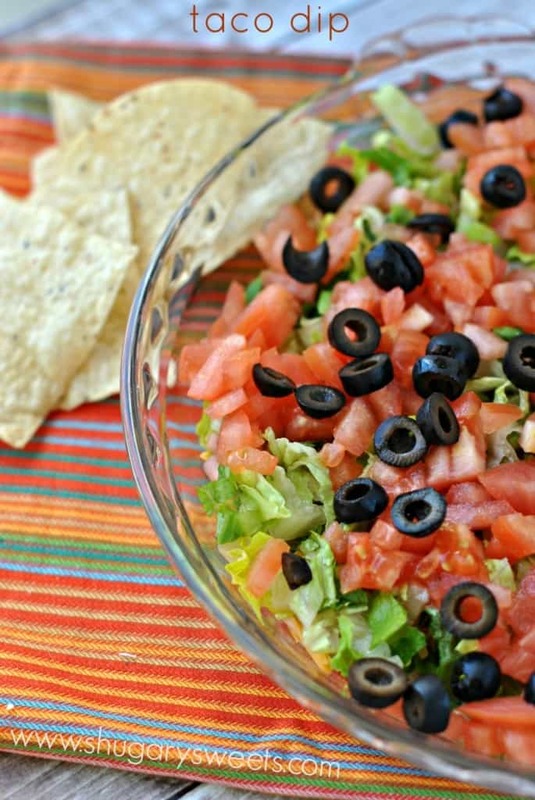 Try making a batch of this Healthy Taco Dip. First, yes, I must admit that we ate this healthy taco dip with unhealthy tortilla chips. But let’s be clear, life is about balance, right? And because it’s game day food, any calorie saving is a good thing. Agreed? Typically when I make a taco dip, I use full fat cream cheese with full fat sour cream. Add in some taco seasoning, top it with ground beef, cheese and veggies and scoop it up with some tortilla chips. Today’s recipe is much lighter, but equally delicious. And, it’s healthy! 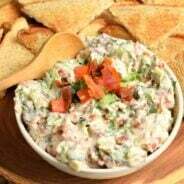 To make the creamy base of this dip, I used plain Greek Yogurt with homemade taco seasoning. That’s it. I also topped this with some reduced fat shredded cheddar cheese. I don’t normally buy reduced fat cheese because it doesn’t melt. But today, since there is no melting, this lower fat cheese was perfect! You won’t miss the thick cheeses and sour cream in this recipe, I promise! 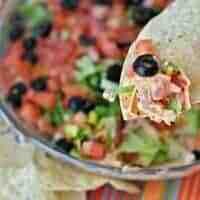 Add your vegetables, such as tomatoes, lettuce, green onion, black olives, even some avocado if you like. If you want, scoop this up with some baked tortilla chips or pita chips. This recipe below is enough for our family of 6, I just spread the dip in the bottom of a clear glass pie plate. You can easily multiply if you’re feeding a crowd. Want to make this a meal? Top it with some cooked, taco seasoned, ground turkey! We may or may not have eaten this three times in January! 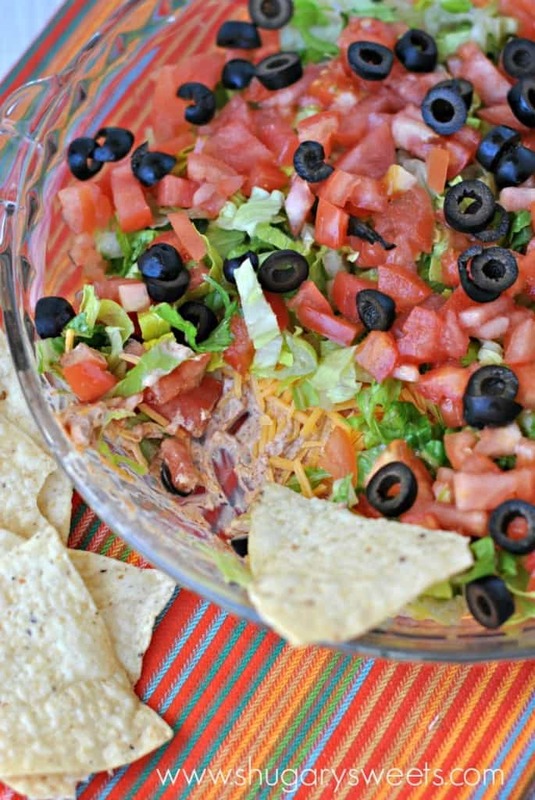 You can also go bigger with this delicious 7 Layer Taco Dip recipe. You can even use my tips to make it spooky for Halloween or festive for Christmas! 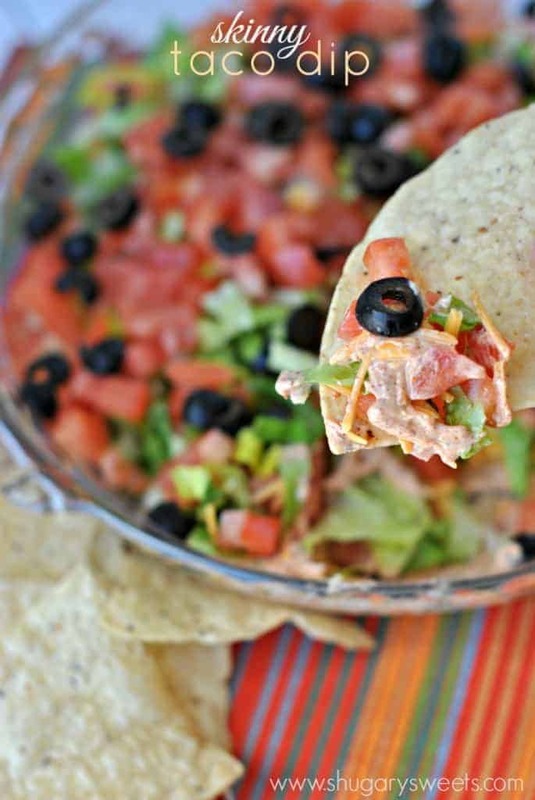 Easy, Healthy Taco Dip recipe using greek yogurt! In a small bowl, combine greek yogurt with taco seasoning. Spread into the bottom of a pie plate. Top with cheese and veggies. Serve immediately with chips. ENJOY! Add taco seasoned, cooked ground turkey to make this a meal! I posted a dippy type recipe today. Yours is healthier though! I want it!! pinned! I always justified my tortilla chip overload with the fact that they are healthier that potato chips 🙂 Greek yogurt is so versatile, isn’t it?! Love it in this Mexican dip! 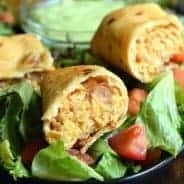 Love that you made a party food favorite healthier. Looks so good! This dip looks so fantastic. I could swim in it seriously! How perfect! 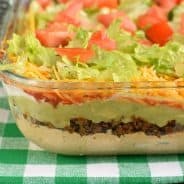 I love taco dip like crazy! Now I have a skinny version. Thanks for sharing! I love taco dip too, this entitles me to eating a bigger bowl with less guilt! I love this Aimee! Greek yogurt is my go-to ingredient in so many things and I love that you’ve used it here. Adding some turkey and making it a meal sounds brilliant but this also looks so amazing on it’s own with some balanced, unhealthy tortilla chips. 😉 Pinning! You’re welcome Renee. It’s such an easy dip to whip up in no time, perfect for after work! I know exactly which unhealthy taco dips you speak of. I love ’em. But I love this healthier version even better. Great idea to use Greek yogurt. Pinning this and keeping it in mind for Super Bowl apps! This is a perfect recipe, my husband will eat this up!! Pingback: Asian style salad with tofu and asparagus | olga, fitness, etc. Pingback: Scones with Chorizo, Parmesan and Asparagus | olga, fitness, etc. Some greek yogurts are definitely thicker than others. Glad to hear it was a hit! What kind of Greek yogurt do you use?